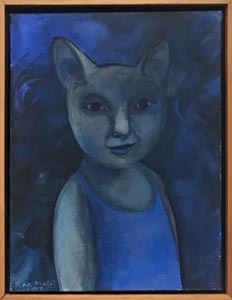 Cats and crocodiles, still life, flowers, children and insightful portraits, real and imagined, these are what Rae Maté is inspired to paint. Illustrator of 5 beautiful children’s books and a continual parade of whimsical and haunting art cards she sells in select stores in Vancouver on Hornby Island during her frequent visits and summer stays there, she is prolific! 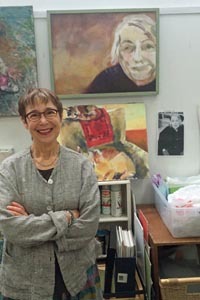 In her light filled Vancouver studio, built in 1997, she paints, draws and continues to study the nuances of oil and acrylic painting. Learning never ends for her and neither does her constant explorations. Her latest and on going interest include abstraction and landscape. Her artworks are almost Chagall like in their expression and understanding of life and love. I was taken with so many of her paintings that occupy almost every inch of her wall space but a few stopped me in my tracks. 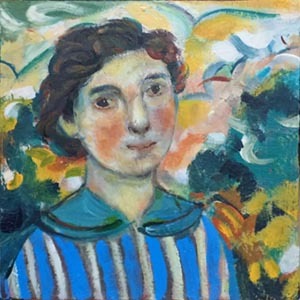 The recent portrait of her mother is so simple, and yet it conveys such sensitivity and depth that I was moved to wonder about her life story. 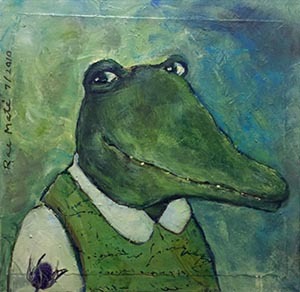 On a more whimsical note yet still profound are her images of playful crocodiles. They are a delight. Rae told me that they bear a resemblance to her late father, who had big green eyes and a wonderful mischievous smile, and was known at times to snap! They are truly compelling and smile worthy. Rae is thrilled to be participating in the West of Main Art Walk this year for the very first time!